Knowing a good wine used to mean knowing the vintage, or year it was bottled. Most winemakers harvest grapes during a specific year, from a specific area or vineyard, and label their bottles accordingly, but some wines may be labeled “NV,” or non-vintage. Non-vintage wines mean juice from two or more different years are blended and fermented together. Most expensive French Champagne is labeled NV, because there is an expectation of taste and color, and the only way to ensure that consistency of flavor is blending the right grapes. Many cheaper mass-market wine producers blend grapes from different years to also maintain a consistency of flavor, bland as that may be. Other winemakers buy specific lots of grapes to blend with another year’s crop because they are looking for a unique flavor profile, to make a better wine. Austin Hope’s Troublemaker red blend falls in that category. Growing up as a self-described troublemaker in Paso Robles, California, Hope wanted to create a wine that was inspired by his youth, and made from specific varieties of grapes that flourish in the area where he grew up. Hope also makes a Rosé and a Sauvignon Blanc, but his Troublemaker Red Blend (now in its 11th incarnation) is a truly distinct Paso Robles blend consisting of Syrah (46%), Grenache (20%), Mourvedre (16%), Petite Sirah (12%) and Zinfandel (6%). 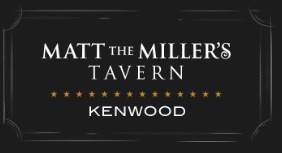 is a crowd-pleaser. If you’re throwing a party, Troublemaker is a crowd-pleaser with rich blackberry and dried cherry flavors, sweet vanilla aromas, and a spicy dry finish. This wine is a little hot, 14.5% alcohol, but I liked it, particularly because you can find it locally for under $15 a bottle. 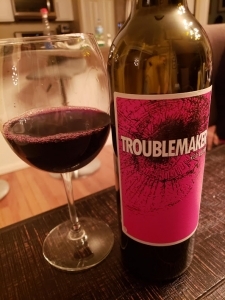 Troublemaker gets 90 points from Wine Enthusiast, and was named an Editor’s Choice. Even esteemed wine critic Robert Parker recommended it as a “big..quaffable…straight-forward party wine.” I couldn’t agree more. On my five-cork scale based on taste and value, the Troublemaker Red Blend gets a solid 4 corks. It’s a really nice wine for the price, and it’s available everywhere.